This two day, nationally-recognized folk festival focuses on traditional, ethnic and folk music with concerts, workshops, jam sessions, demonstrations, master classes, exhibits, a dance and barbeque. Tickets go on sale for the 43rd Annual Missouri River Festival of the Arts (view more). Click here to buy tickets or call 1-888-588-1477. All seating is reserved. Patron memberships are available (view more). If you have questions regarding tickets, reserved seating, or patron memberships please contact the Friends’ office at 660-882-7977 or email fohboonville@gmail.com. 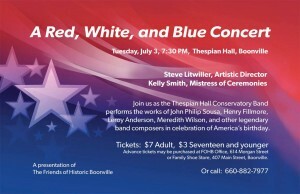 Join us as the Thespian Hall Conservatory Band performs the works of John Philip Sousa, Henry Fillmore, Leroy Anderson, Meredith Wilson, and other legendary band composers as we celebrate America’s birthday. Adult Tickets are $7, Ages 17 and under are $3. Get out of the heat and join us for a night of patriotic music, and a salute to our veterans. 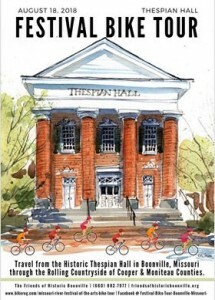 Funds raised benefit the Thespian Hall Preservation and Restoration Fund. Join us for the 27th Annual Big Muddy Folk Festival – April 6&7 2018 at Thespian Hall Click here to purchase tickets on-line or call 1-888-588-1477. A full list of performers will be released in January 2018. Inviting all current members and prospective members to join us on Thursday, November 16th, to celebrate our 46th Anniversary. We will begin with a cocktail hour at 6:00 p.m., followed by a brief business meeting recapping this years’ events and previewing events for the 2018. Tickets are just $5.00 per person. Tickets can be purchased in advance at the Friends Office or at the door on November 16th.